Take desired pictures from DVD movie with ImTOO DVD to Picture for Mac, and save the captured frames as still images like JPG, PNG and BMP, animation like GIF and Flash, and even HTML page. 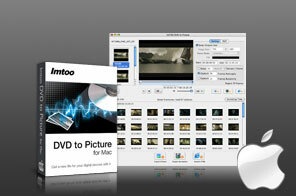 The powerful Mac DVD picture capturer provides you with two capture methods: batch or single-frame capture. As a prominent Home DVD picture capturer, ImTOO Home DVD to Picture for Mac can capture wanted frames from your DVD movie (DVD-Video and Home DVD folder) and save them as static pictures in JPEG, PNG, GIF, BMP, animation in GIF and Flash, even HTML webpage. Two capture modes are provided: batch capture pictures and single snapshot from DVD, to make the Home DVD capture more flexible than other similar software. The special picture list and frame window allow you to preview the captured pictures more conveniently and extract images by frames more accurately. Capture desired DVD movie scenes in batches or singles, and save them as still images like JPG, PNG and BMP, animation like GIF and Flash, and even HTML page. Flexibly capture DVD screen in two ways: extract and output pictures in batches from whole movie or movie segment, or take snapshot and output it directly. A special picture list is designed for you to preview the captured frames and pick the frames you want to output. Using the unique frame window, you can choose exact pictures frame by frame in the way of displaying all pictures in every 10/20/40 frames. Offer three methods for batch capture: extract by time interval, capture averagely or randomly. Take the current frame and output it to Mac directly during the DVD playback in the built-in player. Trimming DVD to get certain video segment without ads, trailers makes capture more exactly. Highlight a title/chapter and select a batch capture method to capture and output pictures directly in batches. Specify the output image size and choose zoom mode and color to fill the blank edge out of scene. Drag-and-drop picture is available when outputting picture from DVD player, picture list, even frame window to Mac. The DVD picture creator makes it possible to capture scenes from DVD movies with subtitle and angle. Convert DVD to iPhone MP4 video and iPhone audio files for Mac users.